This from Dave: Dave Vance still lives with his wife and three children on the same planet where most of his ancestors were born. In his childhood his family lived in Europe and the US which afforded him and his father the chance to do local genealogy research on his Irish ancestors, and so Dave has always equated genealogy with exploration which certainly continues into this new frontier of genetic genealogy. 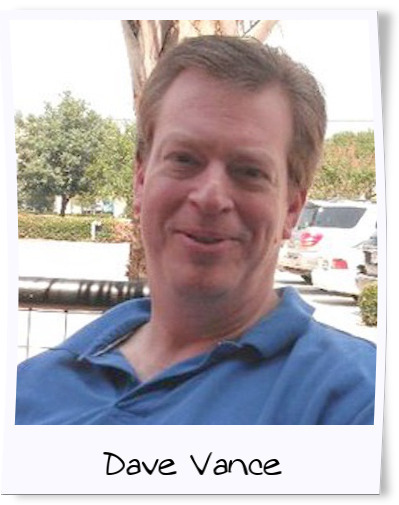 For much of his business career Dave was a programmer for IBM where he learned the value of using computers to tackle life's easy questions so we can all agonize more over the unsolvable ones. I am treasurer of the Vance Family Association and I also run their online blog (vancehistoryonline.blogspot.com). I am also co-admin of the Vance Y-DNA surname project (FTDNA), and an active member of the R1b-L21 and R1b-L513 Y-DNA projects. I am an IT services executive (client partner and associate VP for HCL America, previously 30+ years with IBM). When I was 6 years old my family moved from the US to Belgium following my father’s job transfer. I grew up seeing most of the U.K. and Europe from the back of our family car on vacations, and since my father was also his family’s genealogist, trips to Ireland became his opportunity to research his Irish roots. I probably have a different perspective of Ireland than most tourists; I know the National Library and visited near every graveyard in Donegal but I’ve never seen Cork or Blarney Castle! Later as an adult I was able to add to my father’s research using the explosion of searchable reference material available on the Internet and connecting with the Vance Family Association. We were finally able to “cross the pond” and find marriage and birth records for our Irish Vance line on the Inishowen peninsula in the late 1700s. Since it is unlikely that Irish records will take us any further, I have turned to general research on the Vance surname and genetic genealogy as the most likely sources of more information about my ancestors. When I was working for IBM they were one of the partners for the first National Genographic Y-DNA test in 2005 and I was able to take that test at a reduced price. From there I transferred my results to FTDNA and followed it with an upgrade to 37 markers. At the same time Adam Bradford, one of the early enthusiasts and citizen-scientists in the genetic genealogy community, organized the available test results for the Vance surname and created the Vance surname project, aligning our results by haplogroup. Those results proved that at least one of the major Y-DNA lines of Vances matched our surname’s “origin story” of being descended from a line of minor Scottish nobility. There are however at least 3 other Y-DNA lines of Irish Vances, including my own, which appear to be old (1300-1400s at least) male lines in Ireland. As more detailed tests became available I eventually upgraded to 67, then 111 markers, and added a Big Y and targeted testing from YSEQ. Along with a few other Big Ys in my branch of R1b-L513 we were able to map our major phylogenetic block and a few private SNPs along our individual branches. We were also able to map out STR signatures for the major family lines where testing had not revealed identifying private SNPs. Now as co-admin for the Vance surname project, I am applying that experience to the other major haplogroups in the Vance project. After playing with Fluxus for a few years mapping out our male-line connections into what Maurice Gleeson calls mutation history trees, I grew tired of staring at spider web diagrams trying to understand relationships between tested members in a genealogical timeframe. At the same time, the growing database of SNPs from more recent timeframes needed to be mapped next to the STR mutation history, and project members were clamouring to have their genealogy research recognized along their various branches. So I created the SAPP tool to help automate and visualize the likely trees that fit all the available data, including any known relationships through traditional genealogy research. Now I split most of my genealogy time between the Vance Family Association and the blog, helping other Vance DNA researchers, and tailoring the SAPP tool and helping other projects use it. I’ll be talking about how to combine available STR, SNP, and genealogy data to build a Y-DNA descendant tree, and how doing that through SAPP (http://www.jdvtools.com/sapp) can automate the process so users can focus more on the results. While the topic isn’t restricted to Irish genealogy, with the heavy amount of Y-DNA testing that has been done on the Irish diaspora it is particularly relevant to Y-haplogroups of Irish origin ... like my own! SAPP has proved very useful in helping me and admins on other projects automate the more manual tasks of charting Y-DNA relationships between groups of men based on STR, SNP and genealogy data. In my talk I will show how the tool can help speed up this analysis for any project or really any group of tested men, and turn what today for most of us is a very time-consuming and laborious process into an opportunity to quickly model various relationship scenarios to find the most likely descendant tree that fits all the available data. SAPP is perhaps the only available tool that combines all three sources of information (STR, SNP, and traditional genealogy), and it’s free and comparatively easy to use and understand. But rather than plugging a tool the session is more about how to build a Y-DNA descendant tree using available data - the tool just simplifies the process so we can focus on the results. So instead of just talking about how a tool works, I’ll cover why and under what conditions SAPP is most useful, and the pros and cons of using automated methods. I will discuss the current state of STR, SNP, and genealogy data and how they will likely change in future. I will compare examples of trees under varying degrees of uncertainty, and show how to use those uncertainties to prioritize further testing. I’ll talk about how SAPP produces TMRCAs for the tree’s branching points and whether they’re really useful. I’ll review what the tool DOESN’T do, and under what scenarios that’s important. And along the way I want to use the example of this tool to prompt some discussion about how to use the data we have available to us and the kinds of tools we need in the genetic genealogy community.